Here are 9 of Carrie Underwood’s all time songs. Checotah, Oklahoma native, Carrie Underwood, since winning the fourth season of American Idol in 2005, has sold over 65 million records and charted 20 number one singles, and she’s also taken home seven Grammy awards, but Carrie Underwood’s greatest songs of all time was “Before He Cheats.” This song has sold more singles and charted higher than any other Carrie Underwood country song she’s ever sung. This song established Carrie Underwood as a veritable country music superstar and she’s still burning up the charts today. This might be the most radical song that hit the country music charts because it’s rare to find any song listed on Billboard’s country music charts with Jesus’ name in it but that’s just what happened as Jesus, Take the Wheel was the Song of the Year in 2007, which won her a Grammy Award. If you think about all the songs in country music history that hit number one, rare is the song that speaks about one’s faith in Jesus Christ. The song went on to become a Platinum record. The song, Blown Away, is among her finest vocal performances and may be the greatest creative single this woman’s ever sang. Maybe it’s because so many Americans can relate to this song of heartbreak and pain. This song is much different than most she’s done because it’s full of passion and has a hard-edge about it. Whoever hears this song cannot listen to it without relating to it or feeling some sense of emotion. This song clearly established Carrie Underwood as a country music star and one that’s here to stay. The song, Two Black Cadillacs, became one of her greatest music videos of all time but also one of her best music videos and top storytelling songs of all. This song seems to be a Stephen King-inspire song because the lyrics address the story of two women who were both involved with the same man and at the same time. One woman, being his wife, the other unaware being unmarried and when they realize they are both involved with the same guy, set aside their differences and decide to kill him. This made this song one of the most unique country music songs of all time. I Told You So, is as country as Carrie Underwood gets. This duet with Randy Travis is nothing but sheer country music with all of the pop and heavy production missing, but that’s what makes this simple song so great and why it won a Grammy. Her live performance at the Grand Ole Opry with Randy Travis was one of the few times that she’s sang with another country music singer and for those who saw this live performance, it was one of a kind. The song, Last Name by Carrie Underwood, was made into a video and may have been the sequel to her massive hit, Before He Cheats.” This song shows the spirited side of Carrie Underwood, like few other songs do, and at the 51st Grammy Awards, she won her third consecutive Grammy Award for Best Female Country Vocal Performance, and has sold well over a million copies around the world. This moderate up-tempo song describes a woman meeting a man at a club, and later, eloping with him in Las Vegas after having had too much to drink that night. Carrie Underwood’s, Mama’s Song tugs on most people’s heart strings but for some of her fans, it comes off as a little personal of a love letter to her mother about her hubby Mike Fisher, even though she wrote it prior to her engagement. Even so, this song won a Grammy and BMI award because of its openness and tenderness and sang this at the 44th CMA Awards show in 2010. The song was nominated for the Best Country Solo Performance at the 54th Grammy Awards show. The song, Good Girl, by Carrie Underwood, revealed her hard-edge side. In this song, Carrie Underwood warned her friend, a “good girl,” about her ex-boyfriend and trying to tell her that he’s actually no good, and that she’d be better off without him. Roughstock says of this song that it’s the best up-tempo vocal that Carrie Underwood has ever given country music radio and if you’ve heard the song, you might see why they say that. Bill Lamb of About.com says that the song literally crackles with rock guitar and vocal fireworks while encouraging audience participation. Carrie Underwood’s Something in the Water, is one of the most inspirational songs she’s ever sang. This song won her a Grammy Award for the Best Country Solo Performance in 2015 and comes from her best-selling album, Greatest Hits: Decade 1. This song also earned Carrie Underwood the Billboard Music Award for Top Christian Song in 2015 and is one of her personal favorites because it expresses her faith in God. I know I must have left off some of the Carrie Underwood songs that you believe should be among the top nine songs of all times. 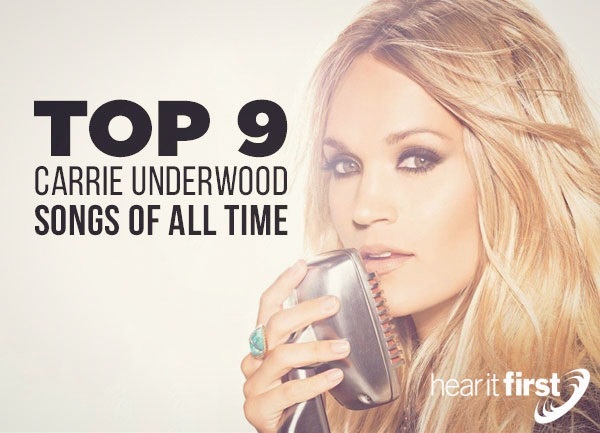 If so, please feel free to suggest a title and give us a reason why you believe it should be listed as one of the top nine Carrie Underwood songs of all time. I could have included Church Bells, Leave Me Alone, Clock Don’t Stop, Dirty Laundry, Lessons Learned, and Get Out of This Town. Tell us what you think.